The event Irashai Fukushima was held this weekend in Fukushima to raise funds for the city, affected by the nuclear incident caused by the March 11 earthquake and tsunami. 12 mangakas held a sign session and others contributed with sign boards for charity. The event’s official website mentions that CLAMP contributed with a CLAMP Gakuen Tanteidan illustration, I wonder if it’s a mistake or there is a second illustration? CLAMP members Nanase Ohkawa and Tsubaki Nekoi were seen at the event, although CLAMP did not perform a sign session. On other news, Bandai Visual will release the two Card Captor Sakura movies in Blu-Ray format on August 26 for 6.300 yens each. The covers will feature new illustrations drawn by CLAMP (source). 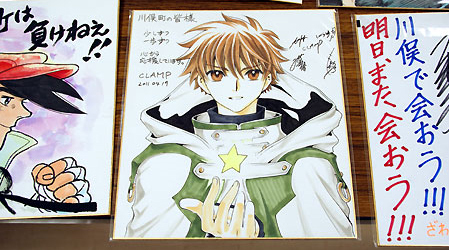 The Syaoran’s illustrations is nice~ He is also holding a star, just like CCS|Sakura before him. That said, the discs cover are old anime illustrations…I suppose they are subject to change? The star is nice! Syaoran is so grown up in that illustration! It’s a very vivid illustration. And here I thought Sakura couldn’t get any cuter; I was wrong. What a beautiful Syaoran illustration. Let’s hope that it raises lots of money for the cause. She’s Kuro and I’m Fai just fyi in our group. It’s a running joke. Glad to see Clamp is working so hard for the earthquake victims.